So many of y'all may be wondering why I've not been working on the site much lately. It's been the usual carousel of reasons- kids not sleeping, work being work, me being lazy ol' me, etc., etc., but there's been a little more to it than just that. Turns out I've got a little bad news that has quite a lot to do with an email I got back around Christmas. 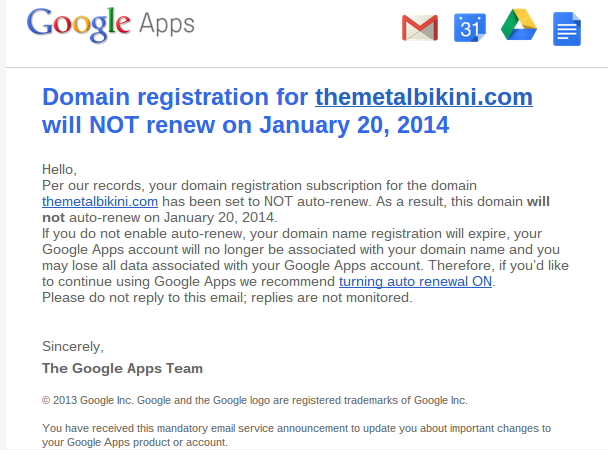 When I bought my domain through Blogger.com nearly a year ago now, I didn't set it to automatically renew. Why? Well, let's be honest- I've had like four other websites over the years, at least one of which was supposed to turn into kind of a big deal and well... it didn't, and $10 is $10, y'know? 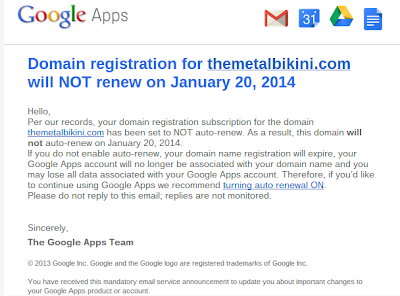 Plus, I don't know, I always figured it'd be easy enough to go into my Blogger dashboard and bullet the auto-renew button or whatever if something crazy happened and TheMetalBikini.com actually did go and become popular, right? It's kind of a long story and I very seriously doubt you really care about the nuts and bolts of it, but the short version is try as I might, I can't seem to find a way to get this thing licked. I guess I was supposed to register with Google Apps when I did the domain, but I didn't and now I don't seem to be able to. And I've tried- believe me. Not to the point where electronic devices are getting thrown across the room, but pretty much the step on the knob just right beneath it. So what's going to happen on 27 Jan (the actual date of expiration)? I don't know. I'm guessing my site will just lose the domain and go back to being a non-custom domain Blogger site, but from reading a bunch of posts in help forums and stuff, it seems like there's at least a chance that it'll just get deleted entirely. This is why even though I'll probably figure out how to fix this or one of you guys will email me and be all like, "Yo- dumbass. Go here, click, this, and you're good." I wanted to give y'all a heads up in case I don't get it fixed and it really is just kinda stuck in this limbo between Blogger, Google, and GoDaddy. 1) Site loses TMB.com domain, reverts back to kinda generic Blogger address, I register a new domain and set it to auto renew this time. This is of course, assuming that actually happens and the 200-some-odd pages of content I've created over the past year doesn't just vanish. 2) I set up an entirely new site where I talk about games besides just X-Wing. I play other stuff too, y'know and you guys likely do as well. Maybe you'd like hearing about other games, maybe you'd just rather read about my take on X-Wing. 4) I call it a day on all this crazy business and just go back to being a mild-mannered billionaire with a mansion and a yacht with an inexplicable penchant for hunting cartoon rabbits. All that aside, I'm sure at some point I'll get bored enough when the kids get a little older that I'll try out some other goofball idea to entertain strangers, so if you don't want to lose track of me, follow me on Twitter (I'm @Cid_MCDP) and/ or G+ (same name, but without the underscore- cidmcdp) and and we'll see where we end up here. I'll go back and read through my emails from the Google Apps folks again, and try the links and stuff again, and now that I've finally bitten the bullet and written this article, maybe stuff will magically start working. Kinda like back in the day when you could smoke in restaurants and you'd wait for what seemed liked hours on your dinner, only to instantly summon your food when you finally broke down and lit up a cigarette, y'know? Who knows. If that happens, everything goes back to normal. If not, I may take article requests for the last few days or do some Q and As with you guys or whatever. I don't know. Again- I'm open to ideas here. Let me know what's on your minds. Oh- the good news I mentioned in the title? Yeah. Ain't any. Sorry y'all.